Looking for a Used Regal in your area? CarGurus has 2,763 nationwide Regal listings starting at $2,450. General Motors added the widely acclaimed Insignia, built by its European label, Opel, to Buick's 2012 lineup. Over the pond the Insignia is known as a car with 50 international awards under its belt, an autobahn sweetheart and the single most fuel-efficient midsize sedan available. Over here, the new Buick Regal took many by surprise with the way it returned last year after 6 years of silence — and when the dust settled, so did the fanfare. Promising as much as 25 mpg city/36 highway with its eAssist-equipped light hybrid 2.4-liter engine, the Regal definitely brings home some fuel-efficient bacon, but it was marketed as a repackaged Eurosport, and offering anything less than 300 points for horsepower and torque on a sedan this hefty will surely disappoint American drivers looking for some of that autobahn charm. Handling and acceleration are harshly criticized by all except owners of the top-shelf GS, who enjoy a near-7-second acceleration from standstill to 60 mph. The 2-liter turbo version, aptly named Turbo, of the same 4 cylinders in every 2012 Regal arrives at just over 8 seconds, while the Base 2.4-liter took nearly 10 seconds on the same benchmark. Although this is definitely an improvement over last year's figures, all but the GS are still woefully below what American drivers would expect of a sport sedan - but as an affordable and economical daily luxury driver with German cues, the Regal stands tall. These 3 trims - Base, Turbo and GS - further segment according to your option packages, opening up a massive array of choices, some far pricier than others. The most basic Base offers an unmodified 2.4-liter engine good for 182 hp, 172 lb-ft of torque and 19 city mpg/31 highway, but the eAssist powertrain and Premium 1 or Premium 2 option packages are available upgrades. The Turbo takes the same 6-speed manual-automatic and adds the option of a 6-speed manual, but gets a 2-liter turbo engine putting out 220 hp and 260 lb-ft of torque for somewhere in the ballpark of 18/32, and the Premium 3 option pack is also available. The GS gets the Turbo's engine and transmission choices with the added benefit of a free-flowing exhaust, bumping those figures up to 270 hp and 295 lb-ft of torque at the cost of about 2 mpg. If top-notch performance is not high on your list, the Base comes standard with a surprisingly long list of upscale features. Notable features include 18-inch alloy wheels, automatic headlights, heated mirrors, dual-zone automatic climate control, full power accessories, remote keyless entry, leather upholstery, heated front seats, split-folding rear seats, tilt-and-telescoping steering wheel, auto-dimming rear-view mirror, OnStar, IntelliLink smartphone integration, Bluetooth streaming connectivity, iPod connectivity and a 7-speaker sound system with CD player, satellite radio and an auxiliary audio jack. If that list wasn't formidable enough, notable options from Premium 1 through Premium 3 include keyless ignition/entry, remote start, rear parking sensors, automatic xenon headlights, a stereo upgrade and adaptive suspension dampers with selectable drive modes. The GS is expectedly outfitted with all the sporty trimmings, from Brembo brakes to sport-tuned accessories and a sport steering wheel. Complete with front parking sensors to keep your nose clean, the GS is surely the coveted member of this Regal family. What's your take on the 2012 Buick Regal? 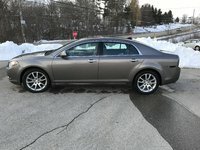 Users ranked 2012 Buick Regal against other cars which they drove/owned. Each ranking was based on 9 categories. Here is the summary of top rankings. 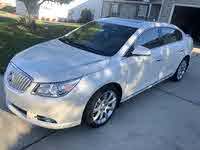 Have you driven a 2012 Buick Regal? Two different dealerships have told me I have leaves blocking the air conditioning vent and they can't get to them. Can this be true ??? Can you access the vent under the dash??? ?